Seth MacFarlane's Star Trek send-up The Orville could find itself crossing over with Family Guy, the veteran animated comedy he created and stars in for the same network (FOX). 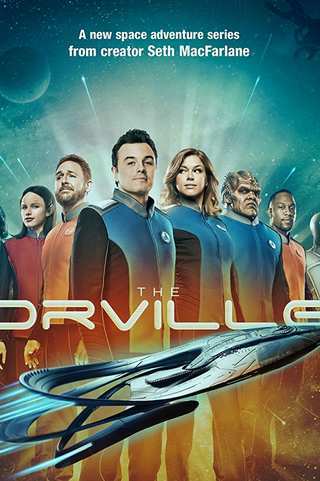 Family Guy, of course, lampoons pretty much anything that get successful in pop culture, so upon getting a second season, it seems like almost a no-brainer that The Orville would end up in the crosshairs of MacFarlane's sense of humor, which is often self-referential anyway. But this could be canonical, where members of the Family Guy characters actually interact with the cast of The Orville, rather than it being one of the show's trademark asides. "I sent the script on a slow boat [to approve]," executive producer Rich Appel said during FOX's Family Guy panel at the Television Critics Association today. "But we end up live on the bridge of The Orville. We'll see." The Orville will be back with a longer season next year, although it will not be a full 22-episode order, and it will likely go into production (and thus air) a bit later than fans might hope, because MacFarlane says he would rather do a smaller number of great episodes than a larger number where some of them are filler. The idea of a crossover between two hugely successful shows might have been a greater cause for a stir if not for Family Guy's ability to "cross over" on a dime and the fact that so much of FOX's presentation at TCA was hijacked by discussion of the network's parent company being acquired by Disney. MacFarlane, who was "remarkably unfazed" by the sale, said he expects his work situation to remain the same working under Disney. “I don’t expect it to change all that much," MacFarlane said, adding he believes Disney will treat Fox the way it did its more adult-oriented label Touchstone and "let it be its brand." "Disney obviously is its brand," he noted. "I don’t think a whole lot is going to change." Asked if he had anxiety over Disney's buyout affecting the content of the far-from-family-friendly Family Guy, MacFarlane offered a simple "I don't." Disney chief Bob Iger reached out to MacFarlane to talk about the deal, and the pair had a "very good" phone call. MacFarlane recently created Star Trek-inspired The Orville for Fox. The network recently renewed the live-action sci-fi comedy drama for a second season.